I started these experiments with a theory, that I could use computer hexidecimal codes as a basis for a dye recipe. My first experiment led me on quite an unexpected journey (that series of posts starts here). After some trial and error, I got close enough results to want to try a second experiment. I learned a lot from the first experiment, but even so, I decided to follow the same procedure, to see if there is a pattern to the results. I based my dye recipe on totaling the above and calculating the relative percentages from that total. These percentages gave me the starting point for my recipe, substituting fuchsia for magenta, and turquoise for cyan. From the first experiment I had learned that fuchsia is very strong in it's dyeing power compared to the other colors. I found that to get the yarn color to match the computer color, I had to adjust the percentage of fuchsia (see this post for details on that). Since I wasn't ready to draw a conclusive ratio based on that one experiment, I started with this second recipe "as is," and adjusted the fuchsia for subsequent samples. 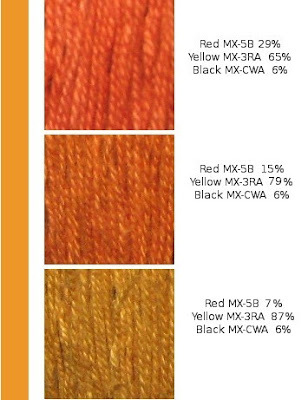 I used those percentages to calculate milliliter measurements of individual dye stocks, based on the weight of the yarn I was dyeing for my samples. My conclusions? Well, based on only two experiments (which is not a very scientific statistic), I think that hex codes can be used as a basis for developing recipes, though not as recipes. The first step is to adjust any magenta (fuchsia) in the recipe, and that a decrease to 25% of the percentage in the computer hex code is a good starting point for approximate results. There may be other factors involved, but I would need to experiment more to determine that. I'm not sure yet if I'm going to try any further adjustments on this particular color, or if I'm going to move on to another experiment. 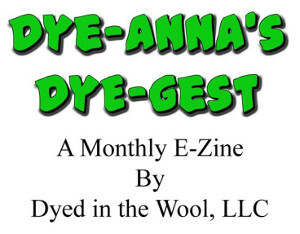 Summer seems a good time to dye, and since I have quite a bit of it left, I plan to make good use of it. Love the colors you come up with!! I must admit I had trouble understanding the whole color mixing thing when you first began this project. But at last it begins to make sense. Your walkthroughs of the process have been enlightening, not just for using dyes but also for how colors work together in general. And I love that gold! Thanks again for the book recommendation from you and Peg, my copy of Creating Colour - A Dyers Handbook came in the post today. I'm very impressed by the practical approach to dyes and dyeing and the graduation exercises to help understand how the different dyes behave. I don't know how accurate the colour in your photos is, but I think I'd want to reduce the black? The photo looks like there's a kind of grey cast to the colour on the yarn. Keep dyeing, I'm watching with great interest ;) I might eventually have time to get started myself (sigh). I agree that the hex codes are producing a great jumping off point. This is such an interesting process! Hi I found this fascinating although like Wool Enough I had problem following it but it is starting to make sense and it's is great fun and another way to look at colour mixing too. An interior designer told me yesterday that nowadays they talk about hybrid colours which is what you seem to have ! ( I think) I felt that you gold was too acid compared with the original sample so I thought maybe increase the fuschia a little and I agree with Dorothy reduce the black too. I appreciate all your comments. I'm glad it's making even a little bit of sense. I know that it's hard sometimes to explain something well enough for others to understand, especially theory. I agree about increasing the fuchsia, but I think it is the computer > monitor issue that is perhaps graying the gold out on your screens. I admit that in real life, the color isn't exactly the same. I do appreciate the input however! Fascinating and frustrating (for me), Leigh: again something I must try one day. And I love your waffle weave! I am so glad you did this! I want to try my own experiments very soon since I just got a commission with specific colors. I didn't want to buy more dye so I may be able to squeek by using what I have on hand. If not, I'll have had fun and get to buy more dye.